Obituary for Frances V. Prus | Laughlin Memorial Chapel, Inc.
peacefully on Friday, November 30, 2018. Devoted daughter of the late Louis and Eva Prus; cherished sister of the late Joseph (Mary), Edward, Stephanie (Walter) Balawejder, Irene (Merle) Addams and Eugenia Fratangelo – her best friend; also survived by three generations of nieces and nephews. Fran was a hairstylist for over 50 years in the former Jenkins Arcade and counted many of Pittsburgh’s most notable women as faithful clients. She enjoyed traveling with trips to Hawaii and Portugal among her favorites. Frannie loved the game of golf, was a terrific dancer, she just loved a good time, but her true passion and addiction was for Milk Chocolate. 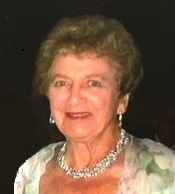 She was a longtime member of the University Club and was an active member of the Polish Women's Alliance, serving for many years as an officer of her local group. Frances was a woman of devout faith without wearing it on her sleeve and could often be found praying the rosary. Throughout her life she was selfless and generous to a fault, caring for her parents and family members often sacrificing her own needs. Because she had no children of her own, Aunt Fran adored her nieces and nephews and left each of them feeling as if she were their second mother. That maternal love was expressed and shared earlier this year with the large gathering for her ‘100’ birthday celebration. Frances was the last of her generation and the end of an era which left a legacy of Polish roots and American Heritage. We will always cherish their individual talents and qualities. We were all blessed to have her in our lives. Friends will be received at Saint Bernard Church, 311 Washington Road, Mt. Lebanon, Friday morning from 9:00 until the Mass of Christian Burial at 10 o’clock. Interment Calvary Cemetery. Memorials may be made to St. Anthony's School Programs, 2000 Corporate Drive #580, Wexford, PA 15090 or St. Bernard Church, 311 Washington Road, Pittsburgh, PA 15216. Arrangements entrusted to Laughlin Cremation & Funeral Tributes.